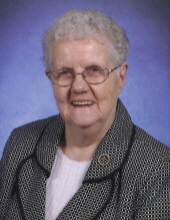 Betty Burke Meade, age 88 of Carrollton, passed away August 8, 2018. She was born November 6, 1929 in Chicago, Illinois. She worked for CBS/Sony for more than 25 years in the Return RA department, was treasurer of Tops for more than 20 years, and was a volunteer worker at the Women and Children’s Shelter in Carrollton Georgia. She is preceded in death by her mother, Eva Elmore; sons, Mike Meade and John Meade; brother, David Elmore; and a sister, Clotine Conrad. She is survived by her daughter and son-in-law, Debra and Jeff Overmyer of Carrollton; sons, Thomas Meade and Daniel Meade both of Carrollton; brother and sister-in-law, Fred and Rose Elmore of Terre Haute, IN; three grandchildren, Jeff Meade, Carrie Meade, and Brian Lewis; seven great grandchildren; and several nieces and nephews. Visitation will be Thursday, August 16, 2018 from 5:00 PM until 7:00 PM at Barnes and Rice Funeral Home in Rockville. Graveside Services will be Friday, August 17, 11:00 a.m. at Memory Garden Cemetery in Rockville, Indiana. In lieu of flowers, donations can be made to the Carroll County Emergency Shelter at www.domesticshelters.org or to Amedisys Hospice Newnan at www.amedisys.com . To send flowers or a remembrance gift to the family of Betty Burke Meade, please visit our Tribute Store. "Email Address" would like to share the life celebration of Betty Burke Meade. Click on the "link" to go to share a favorite memory or leave a condolence message for the family.